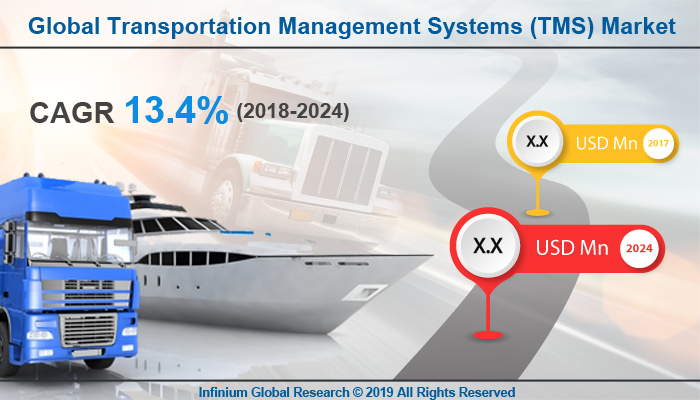 A recent report published by Infinium Global Research on transportation management systems (TMS) market provides an in-depth analysis of segments and sub-segments in the global as well as regional transportation management systems (TMS) market. The study also highlights the impact of drivers, restraints, and macro indicators on the global and regional transportation management systems (TMS) market over the short term as well as long term. The report is a comprehensive presentation of trends, forecast and dollar values of global transportation management systems (TMS) market. According to the report, the global transportation management systems (TMS) market is projected to grow at a CAGR of 13.4% over the forecast period of 2018-2024. A transportation management system (TMS) is part of supply chain management (SCM) positioned on transportation logistics. Transportation management systems provide a solution that helps companies to carry out operation more efficiently, reliably and cost-effectively. A transportation management system serves as the central logistics system for the collaborative networks of shippers, carriers, and customers. The benefits offered by the transportation management system are automating the merchandise payment and inspection processes, users can reduce errors that may arise from manual procedures. Various tasks of transport management system include route optimization, real-time transportation tracking and vehicle load, scheme simulation and transport costs, and freight audit. Rising demand for software as a service (SaaS) based transport management systems are the major factor driving the growth of the transportation management system market. The use of real-time data has led to significant time and cost savings of the transportation management systems. The emergence of cloud-based solutions is also anticipated to trigger the replacement of aging conventional TMS solutions. Oracle, Infor/GT Nexus and SAP are leading vendors that offer transportation management systems software, among a broad range of other enterprise applications. Moreover, an increasing partnership between hardware providers and content suppliers are strengthening the growth of the transportation management system market. However, Lack of awareness about the transport management system is likely to curtail the growth of the transportation management systems market. Furthermore, recent developments in software, such as predictive analytics and machine learning; and changes in the concept of manufacturing, such as 3-D printing are anticipated to create several growth opportunities for the key players in the transportation management system market. On the other hand, growing digitalization in emerging economies are having a positive impact on the growth of the market. Among the geographies, North America dominated the transportation management system market. The growth in the North American region is due to the due to the integration of GPS and route planning system. Developing economies such as India and China are witnessing significant growth over the forecast period owing to the continuous requirement of cost-effective operations in the Asia Pacific regions. The report on global transportation management systems (TMS) market covers segments such as components, transportation mode, deployment type, and application. On the basis of components, the sub-markets include hardware, solutions, and services. On the basis of transportation mode, the sub-markets include roadways and seaways. On the basis of deployment type, the sub-markets include on premise, and on demand. On the basis of application, the sub-markets include industrial transportation, consumer goods and retail transportation, logistics transportation, electronics and electrical transportation, food & beverage transportation, and others. The report provides profiles of the companies in the market such as MercuryGate International Inc., Amber Road, Inc., KRATZER AUTOMATION AG BluJay Solutions, Omnitracs, LLC, inet-logistics GmbH, CTSI-GLOBAL, The Descartes Systems Group Inc., and JDA Software Group, Inc.. The report provides deep insights into the demand forecasts, market trends, and micro and macro indicators. In addition, this report provides insights into the factors that are driving and restraining the growth in this market. Moreover, The IGR-Growth Matrix analysis given in the report brings an insight into the investment areas that existing or new market players can consider. The report provides insights into the market using analytical tools such as Porter's five forces analysis and DRO analysis of transportation management systems (TMS) market. Moreover, the study highlights current market trends and provides forecast from 2018-2024. We also have highlighted future trends in the market that will affect the demand during the forecast period. Moreover, the competitive analysis given in each regional market brings an insight into the market share of the leading players.